Nowadays, people would rather prefer an automatic garage door than a manual one. Nevertheless, the manual doors haven’t fallen into oblivion yet. They are still being offered for new homes. On a first impulse, the automatic door seems to be unrivalled. In reality, both types of products are great competitors in the marketplace. On the one hand, an automatic door appeals to those who are fond of technology. For example, people do not have to get out of their vehicles in order to open the garage. All they have to do is to push a button on their remote control and the entire job is done. This type of door is beneficial for everyone supposing that it is raining or even snowing outside. On the other hand, a manual door is quite impractical due to the fact that it must be lifted up by somebody. Secondly, from a different point of view, those manual garage doors are more secure. Many of them are dual-locked. That is the main reason why it is quite hard for thieves to gain access into your house. In contrast, if you own an automatic door with a radio operated motor, you must know that its’ entire system can be compromised easily using a radio frequency scrambler device. Furthermore, as the door is closing, somebody can place an object in the path in order to force the garage door to open. Thirdly it is easier to fix a manual door than an automatic one. For instance, all you have to do is to replace any garage door spring. If you have to repair or even replace your garage door torsion spring, it will not cost very much due to the fact that it is a cheap mechanical piece. Supposing that you need to repair your garage door rail, it will cost you a fortune. 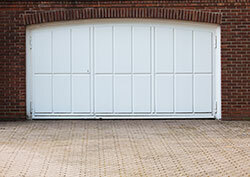 Hence, from an economic standpoint, a manual garage door seems to be the best option.